Are you planning to start a low cost business but don’t know where to start? Are you wondering how to find low cost business ideas that will bring you quick success and profitability? If you are searching for small business ideas, consider yourself as a lucky. Your search ends here. 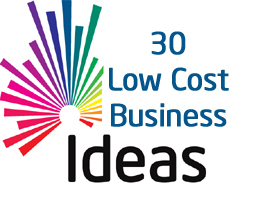 Here is a list of 30 low cost business ideas for startup in India. As we know low cost is a relative term. A cost which is low for some may be high for other. So, to make it crystal clear I am going to share business ideas which can be started with an initial cost of Rs.10,000. The first low cost business idea is starting home based tuition class. It is a lucrative business idea that can give you good income. You just need to invest money for buying a white board and marker pen. You can offer tuition to individual student or in large groups. You need to be knowledgeable in the subject you are intended to teach. You can advertise your business by mouth to mouth marketing or by social media. Network Marketing or MLM is next low cost business, which can be started with small capital of Rs.10000. MLM is also known as referral marketing. In this business, you need to sell product of network marketing company by making new member under you. You will get commission for selling product and making members. This business has very good earning potential provided you work systematically and dedicatedly. Starting a tea or coffee shop is next in the list of low cost business ideas. In this business, you need to rent small place or stall for opening tea stall. You will also need raw material for making tea and coffee. For getting quick success your shop should be nearby college or business place. You might have noticed that fast food joints are almost always filled with customers. This is because most of the people are fond of fast food. It is one of the sure shot successful business. To open up your own fast food joint, you need to invest money in renting place. You need to take permission from the local authority for starting the business. If your rent is Rs.5000 per month, you can spend rest of amount for buying a raw material and groceries. If require you can go for higher budget. Travel agency is one of the best business ideas with low investment. The travel industry is an evergreen industry. People across world travel a lot for various purposes. In order to help them with lodging boarding and travel you can opt to start own travel agency. A low cost option of home based travel agency is tying up with host agency. They will help you to get IATA number faster. They will also help with back office operation. You will only receive commission for the customers. The next business idea is starting professional photography. A professional photographer is in demand today. In this business, you just need high-definition camera. If you are already in possession of camera your investment amount for this business would be less than Rs.10000. You just need to invest your time in learning professional photography and marketing your business. Tiffin Services is among one of the most promising business ideas. Most of the working professionals have no time to cook food at home. However, they prefer homemade food. If you have expertise to make good food in low cost you can start tiffin service business. The only investment required for this business is salary of middle man delivering tiffin. Lime Soda Shop is next low cost business ideas. In this business, you will need to pay rent for shop space. Other than this, the only big investment you need to do is soda maker and raw material required for making soda. It is low cost low return business. Candle making is home based low investment business. Candles are used for religious purpose and as a decorative items. It is very easy to make candle at home. You just need paraffin wax and colours for making colourful candle. Insurance agency is low-cost low-risk part time business idea. As an insurance agent, you require quality such as good communication skill, convening power, and knowledge. Income of insurance agent depends on upon a numbers of policy sell, amount, and type of insurance policy. You can first start with life insurance and later enter in to general insurance business also. There is a tradition to give a gift on every occasion and people prefer handmade or customized gift. If you are creative and make various gift items at home you can start handmade gift business at home. Once your business is established you can open your own store online or offline. Mobile repair and recharging business is next in the list of low cost business ideas. Before starting this business, first you need to learn mobile repairing. It is recommended to do course on mobile repairing. The investment required for this business is very low. You just need small place and kit for repairing mobile. A blogging is one of the best low cost business ideas. It is proven fact that one can earn a lot of money from blogging. There are numbers of bloggers who are already living their life on blogging. You need to take domain name, hosting space for starting this business. The investment required for this business is less then Rs.10000. YouTube Channel is small investment business provided you have laptop and computer with good internet connection. In this business, you need to make and upload unique videos on YouTube. Once your channel gets popularity and fulfil certain criteria you can apply for YouTube Channel partner program. As a YouTube Channel owner you can earn lot of money. However, it takes lot of time and hard work to make money from YouTube. Affiliate marketing is very good side business which can be started without any investment. In affiliate marketing, you need to become an affiliate of various online store or products to help them to sell their products. You will be paid commission on every sell. This idea is suitable mostly for blogger or online geek. If you have skills to make bakery products such as cake, biscuits, cookies, you can think of starting online bakery. You need to invest money for buying a domain name and hosting space. You also need to arrange for person who can take care of delivery. Like online bakery another small investment business idea is starting online store. In this business, you need to tie up with local store for selling their products on your portal. This means order will be taken by you but delivery part will be taken care by store. You will be working on commission basis. Event organizer is also known as event manger. A task of event organizer is to manage events effectively. This includes evaluating venues, meeting sponsors, scheduling performance, looking for audio visual and food requirement for event etc. Over all start-up cost of starting this business is low. However, to get quick success in this business you need to be very good in communication and networking skills. Wedding consultant or wedding planner is hired to plan and coordinate the wedding celebration. The business start-up of wedding consultancy can be started with low cost. In this business, you need to assist bride or groom for the work related to weeding. It requires experience and expertise to become wedding consultant. Used book store or second hand book store is lucrative business option which can be started with Rs.10000 or even less. You just need to take shop on rent and purchase numbers of book from other book seller. Business model of this business is very simple, buy second hand book with low cost and sell at higher price. Cooking class is another small investment business idea. If you are housewife expert in cooking you can start a cooking class at home. You may need to buy some specialized equipment like oven, tandoor, chopper etc. You may need to take training to improve your culinary skills in making specialized food such as Thai, Chinese, Italian etc. Another start up business which can be started with low investment of Rs.10000 is dance or music school. In this business, you just need suitable space for starting business. You may need to learn dance and music before starting this business. Gardening services is very good business idea. Gardening service includes landscape designing, Lawn, water and soil analysis, garden decoration and vertical gardening services. These type of services are required at corporate and at home. You have to learn gardening service before starting this business. Mobile Auto Garage is latest business that can be started with low investment. You need to keep mobile manpower/repairers for this business. It is a good business idea because car breakdown takes place in the area where garage service is not available. If you have good communication skills you can become real estate agent. Real estate agency is one of the highly profitable business ideas that can be opened with capital of Rs.10000. In this business, you need to help people in finding the right property for rent or sell. You can earn hefty commission from every transaction. Placement agency is popular home based business idea. In this business you just need data of candidates looking for Job. Just refer a candidate to the company and get commission out of it. It is very good small business idea. If you are expert in making chocolate you can start homemade chocolate business. You need chocolate recipe, utensils, cookware, molds and packing material to start this business. You need to tie up with shopping malls or small shop keepers to purchase your chocolate. Disposable paper plate or cup making is next low cost business idea. You can make handmade plates or plan to purchase plate or cup making machine. The demand of disposal paper plate and cup is very high thus starting paper plate and cup making would be lucrative business option. To work as investment advisor first you need to become registered investment advisor at SEBI. The fees for applying for RIA is Rs.5000. You need to thoroughly understand the investment market and options such as stocks, bonds, mutual funds, IPO. It is recommended to gain experience before applying as RIA. Many people want to sell used product and buy new one. Thus starting used product sale is lucrative business option. You required suitable place for starting this business. After successful establishment for few days you can also think of online presence. Please remember that big capital not always required for starting a business. You can start a business with low capital. It is good to have soft skills such as communication skill, financial knowledge, leadership, and innovative thinking for getting success in the business.